Hello there, Am very pleased to see a review by Cameron Woodhead made it into the Short Fiction section of today’s Sydney Morning Herald and also The Age. 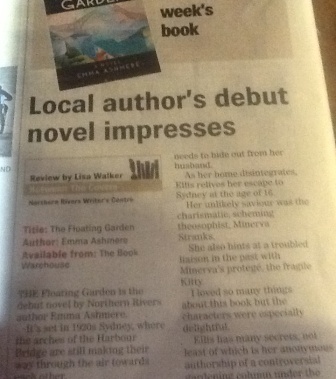 The Floating Garden is the debut novel by Northern Rivers local, Emma Ashmere. It is set in Sydney in the 1920s, where the arches of the Harbour Bridge are still making their way through the air towards each other. Down below in Milson’s Point, a colony of misfits are losing their homes as construction proceeds. The Floating Garden interweaves the stories of two women. Ellis is an eccentric who runs a boarding house for women and girls while Rennie is an artistic Englishwoman in an unhappy marriage. When Rennie plucks up the courage to leave her abusive husband, she finds a temporary home in Ellis’s guesthouse, which is about to be demolished. Both women look to each other to provide security – Ellis needs money, while Rennie needs a bolt-hole to hide out from her husband. As her Milson’s Point home disintegrates, Ellis relives her escape to Sydney at the age of sixteen. Her unlikely saviour was the charismatic, scheming theosophist, Minerva Stranks. She also hints at a troubled liaison in the past with Minerva’s protégé, the fragile Kitty. I loved so many things about this book, but the characters were especially delightful. Ellis has many secrets, not least of which is her anonymous authorship of a controversial gardening column under the name of Scribbly Gum. The flamboyant Rennie hails from a life of privilege and has a hard time adjusting to her new circumstances in the poorer part of town. Her effort to blend in and cope with her situation provides a subtle touch of humour. I also enjoyed learning more about theosophy – a spiritual belief system which was very popular in the 1920s. An early review has compared this book to Tim Winton’s Cloudstreet and there certainly are some similarities. Both books explore the wider events in society through the lens of the people affected and both focus on a working class group of colourful individuals. Like Tim Winton, Emma Ashmere has a fine hand with exuberant Australian types. The author has a PhD focusing on the use of marginalised histories in fiction and her novel does a superb job of bringing this fragment of our past to attention. The Floating Garden is a beautifully written, gently humorous and highly detailed slice of history. It also has an absorbing storyline which kept me turning the page. This captivating debut by Adelaide-born writer Emma Ashmere…teems with charlatans, eccentrics and those doing it tough in a time of hardship and prejudice. Yet Ashmere weaves a sense of hope and redemption as her characters seek to rediscover their true selves. With its pellucid prose and descriptions of gardens and early 20th century spiritualists, I loved this novel… It focuses not on the arches of the Sydney Harbour Bridge, but what happens at its feet. The setting suggests that we should not always focus on dominant, obvious narratives, because what happens in their shadow is equally interesting…This sumptuous book was a joy to read. Emma Ashmere’s writing is subtle and lyrical, beautifully crafted and wise. The best books seem so complete, have such integrity, that we can’t imagine them existing in any other form, and we forget that they may have taken many drafts to get to this point. 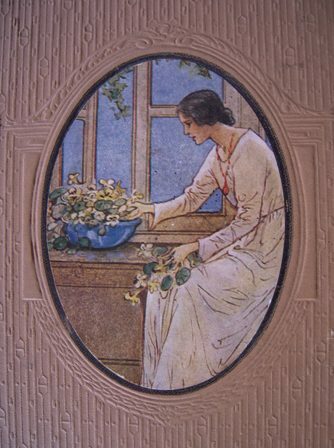 …What I particularly enjoyed about the novel is that Ashmere does for the underprivileged of 1920s Sydney what Ruth Park did for the 1950s in Harp in the south. They are very different books in terms of their narratives and themes, but both exude warmth and sympathy for their motley crew of marginalised characters, and both are valuable for their social history. The first review of The Floating Garden has just appeared on MD Brady’s US blog Me, You and Books. My thanks to MD Brady. Here’s an author interview published in the May 2015 edition of northerly, the magazine of The Northern Rivers Writers Centre. Emma Ashmere talks about why and how she writes (and rewrites). She participated in the NRWC residential mentorship program for emerging writers in 2010. Admittedly, it can be a bit of a moveable feast, as I tend to write in isolated bursts. If for some reason I can’t get to the keyboard, a few minutes of doing something towards the project helps keep me connected to it – even if it’s just looking up what hats were all the rage in 1920s Sydney, ordering a book from the library, deciding on a character’s name, or scribbling illegible midnight notes. Q: How has writing your second novel been different to writing your first? It feels a bit like leaping into the void again – but a friendly void. I’m far less precious about what stays and what goes. Even if a sentence seems tight, it’s likely a thread will be pulled, all will unravel, and need to be knitted back together again. Q: Do your novels change a lot between first draft and later drafts? Yes, thankfully. The story I initially wanted to write is still there in the final draft. But some of the themes, plot lines, points of view, and characters might have expanded, while others will have fallen by the wayside. There have been several instances when it’s been necessary to cut whole chunks either because they were dead ends, overwritten, obsolete, or suddenly belonged in another book. This was daunting at the time, but it instantly opened up new space for fresh approaches and ideas. Q: What are some common mistakes you see among emerging novel writers? Because the best learning about writing happens when you write, mistakes are a necessary part of the apprenticeship. Until you’re underway, it can be hard to understand the time, patience, and resilience needed during the long and hilly path of writing, rewriting, and then (hopefully) feeling your way through the publication process. I’ve found it very helpful and heartening to go to writing events, festivals, workshops, writing groups, book clubs and launches, and to meet other writers and forge supportive connections with a wide range of people in the writing world. It’s also important to enjoy it. Q: What do you find rewarding about teaching writing? When I tutored ‘life writing’ at a Melbourne university, the continual reward was hearing about other people’s lives, which was always surprising, sometimes shocking and often inspiring. My aim was to be encouraging but realistic, to encourage constructive feedback of other students’ writing and their own, while passing on techniques to help people articulate what they wanted to say as clearly as possible – and in their own way. To see people shift from hesitancy to confidence over those weeks was fantastic. All the way through, the learning was very much a two way street. Q: Who are some writers you admire? There are too many to mention here – but some perennial favourites are: Ali Smith, Janet Frame, Toni Morrison, Virginia Woolf, Patrick White, Hilary Mantel, E.L. Doctorow, Alexis Wright, Virginia Woolf, Donna Tartt, Eleanor Dark, Christina Stead and Deborah Levy because they somehow alchemise history, poetry, theory, absurdity, tragedy, politics and dream into fiction. And also Elizabeth Harrower because her psychological insights into seemingly ordinary people doing seemingly ordinary things arrive as sharply and stealthily as paper cuts. Q: If there was one piece of advice you could give to someone about to embark on writing a novel, what would it be? Read widely. And a lot. Emma Ashmere’s novel The Floating Garden is published by Spinifex Press. Meredith Jaffe literary editor of The Hoopla has put together a list of books to read for 2015. The Floating Garden is listed for May. 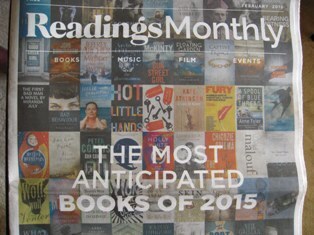 And Readings Books & Music have included The Floating Garden on the cover of their February catalogue as one of the Most Anticipated Books of 2015. 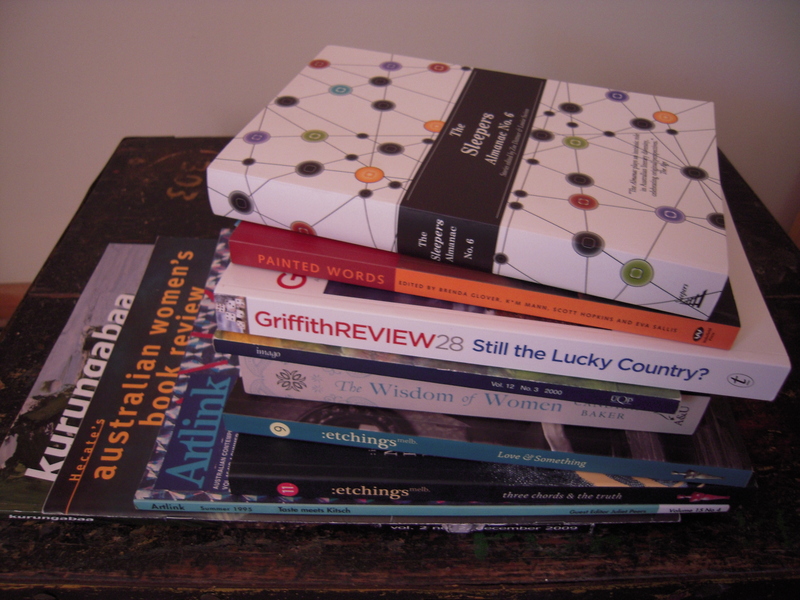 See also their calendar of Australian books to look out for in 2015. To order The Floating Garden see more here. Short story writers are often told to ‘make every word count’. But what does this mean? And how can we identify and winkle out those sluggish words, clichéd ideas, and flaky images that once seemed so vital, original and essential in our own first drafts? Word count can be both friend and foe. A 500 word cap challenges the writer to keep on track, but that track still must offer an arresting glimpse of life, relationships, the world etc. On the downside, enforced limits can cramp your style. When a piece balloons over its allotted space, there are probably only two options. Keep it for another occasion when word limit isn’t an issue. Or cut. Ali Smith talks about needing to find your own ‘balance between instinct and edit’. For some stories less will be more. For others, less really is less. Multiple ideas, extravagant details of setting and mood, the number of characters, or quirks of voice might be the very elements you’d hoped would hook and haunt the reader. Lose those hard-wrought surprises and idiosyncrasies, and the story risks diluting into ordinariness. If a story keeps buckling against the word limit, there’s no going wider. So go deeper. Priscilla Long suggests making a list of ten things you want to include before you start such as objects, feelings, colours, places, people, events, particular phrases. Even if you haven’t done this, go back and see what’s survived the redrafting knife. Is this still the story you wanted to write? After fine-combing through several times, the words that kick-started the piece might suddenly seem clunky. Some will be worth refashioning. Others won’t. Check every word is working as hard as the 499 other pistons hopefully chugging away in the engine room keeping the story ticking over. Even the seemingly insignificant ones such as ‘the’ and ‘and’ must pull their weight. Reading aloud can help detect stumbles, flat spots, unintended repetitions, clumsy rhythms, clanging notes. Try to imagine you’re sitting on the other side of the editor’s desk, listening in. What would make this story leap straight over the ‘no’ pile and into the ‘yes’? Some pieces will never amount to more than exercises. But the act of writing is never wasted. Set them aside for awhile, then revisit and try to see what you’d change in them now. Some pithy lines might even be salvageable for recycling elsewhere. At this year’s Byron Writers Festival, Jeanette Winterson talked about the benefits of having a wood-burning stove in her study. Apparently she feeds it regularly with paper and ink. She also said that good writing of any length means putting ‘the right words in the right order’. Later, this was refined slightly. Good writing is about finding ‘the only words’ and putting them ‘in the only order’. No multiple choice. No ‘and/or’. There’s only one right word, or 500 right words. And it’s every writer’s job to pounce on them and place them where they can chug away, unfettered, at full capacity. This article first appeared in the Northern Rivers Writers Centre’s newsletter northerly, November 2014. Set in Sydney in the 1920s, The Floating Garden beautifully and evocatively portrays both the difficulties and the sense of promise in the post-war era. Through the eyes of Ellis and Rennie, we witness the changes in the tight-knit community of Milsons Point as Sydney’s iconic harbour bridge is built. The novel begins as landlady (and secret gardening writer) Ellis sees the last of her lodgers depart as the demolishers rapidly approach. Ellis appears to be trapped in the crumbling house by inertia and memories. Rennie, on the other hand, appears to have it all—a wealthy husband and a career of sorts as an exhibiting artist. Their worlds collide when Rennie knocks on Ellis’ door seeking refuge from her abusive husband…. This is Emma Ashmere’s first novel after a series of award-winning short stories. There is something quintessentially Australian about this book, and at times it reminded me of Tim Winton’s Cloudstreet. Well, the new Spinifex Press 2014-2015 catalogue is just out – with the first glimpse of The Floating Garden. Extraordinary company to be in – in more ways than one.